"We're off to see a man about a kayak..."
Since the beginning of the new year, Kate and I have found ourselves amidst a whirlwind of activity. 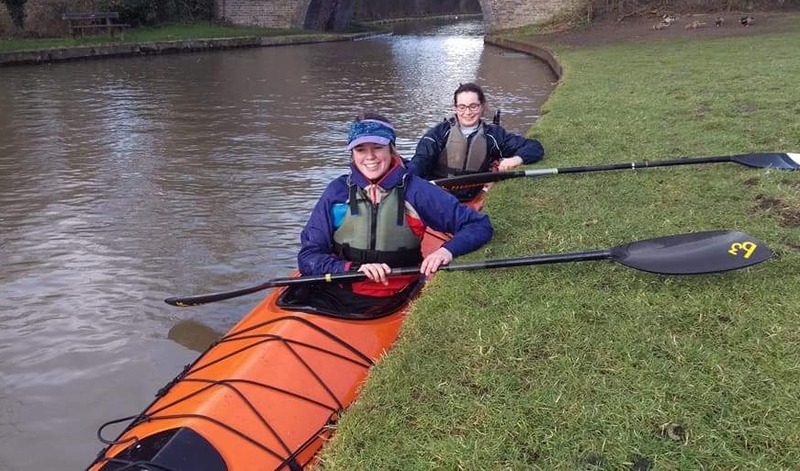 We’ve had hours glued to our laptops, researching potential grants and sponsors or plotting (and re-plotting) our route, not to mention the freezing hours spent paddling against headwinds on the river, trying not to capsize the tippy racing kayak we’ve been training in. But despite all the exciting progress we’ve been making, there’s been one thing looming over us that was proving an immense battle to sort out for our expedition: a kayak. Given the extent of our trip, it is crucial that our kayak meets certain criteria to give ourselves the best chance of reaching the Black Sea, preferably still talking to each other! We had our dream boat in mind: a speedy sea kayak, with plenty of storage for our camping kit, food and water sampling equipment, but still reasonably lightweight so that the portages throughout France, Belgium and Germany were still feasible. We needed something sturdy enough to take on the English Channel crossing and coastal sections in England and France, but on the other hand wouldn’t be complete overkill for the inland waterways that make up the vast majority of our journey. After reaching out to a top kayak manufacturer, Kirton Kayaks, we found ourselves taking a few road-trips down to Devon and Cornwall to test two kayaks designed by the ever-helpful and font of knowledge, Rob Feloy. The boats were fantastic and would both have suited our expedition very well, and Rob was full of incredibly useful advice. However, it wasn’t as straightforward as popping one of the boats on our car and heading back home; it would’ve been necessary to have a new one built for us, something we couldn’t afford in time or money at that stage. Then, as our stress levels were beginning to spike, we received a call from a gentleman who had heard about our expedition and kayak-hunt on Facebook and thought he may be able to help. His name was Bob and he happened to have a double sea kayak sitting at his home in Leicester, one that would be perfect for our expedition. Years ago, Bob lost a close relative to pancreatic cancer and our expedition therefore resonated with him greatly. We arranged to visit Bob and his kayak and a few days later we were back in the car, this time heading north to see a man about a kayak. After spending most of the day with Bob, including a few hours in the kayak, Bob had reached a decision about the future of his kayak. He wanted to donate it to our expedition. And so we find ourselves with a kayak! Less than a week after meeting Bob, he generously drove the kayak down to us in Oxford, helping us take a giant leap closer to our goal. A kayak to call our own!